How to Convert MKV to AVI, Convert MKV to MP4, MKV to WMV? Convert MKV to AVI, Convert MKV to MP4, Convert MKV to WMV? Matroska's MKV "universal" Container is described by its developers as "the extensible open standard Audio/Video Container". This translates to a multimedia Container designed to support practically any type of video or audio stream you might care to use. MKV stands for Matroska Video. The project itself is simply called Matroska. The following MKV conversion guide will show you how to convert MKV to AVI, convert MKV to MP4 and convert MKV to WMV for your iPod, iPhone, Zune, PSP, BlackBerry and a lot more mobile players. Clone2Go Video Converter, with which you can convert MKV, AVI, ASF, MOV, MP4, 3GP, M4V, QT, RM, RMVB, FLV, AVS, MPG, VOB to the specific video format you need, convert video captured from DV to popular video format and download YouTube/Google video for your iPod, Zune, PSP, BlackBerry, etc. Step 1. 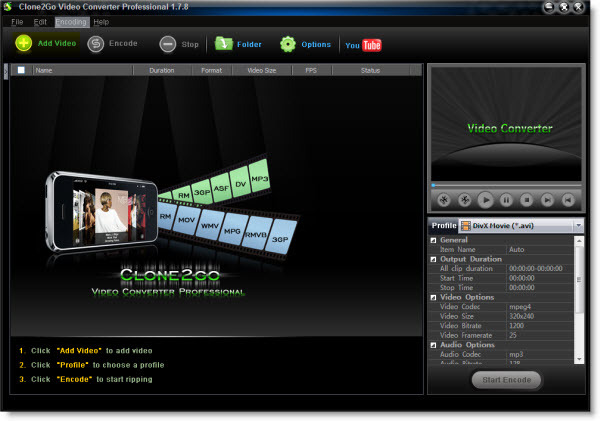 Download the latest version of Clone2Go Video Converter. Install and run it. Step 2. Click the "Add Video" button to import the MKV file. Alternatively, you can click "File -> Add Video Files..." to add the MKV file. 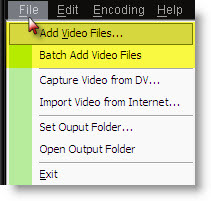 You can also batch import MKV files by clicking "File -> Batch Add Video Files". Step 3. From the "Profile" drop-down list, you can choose the most appropriate output format. 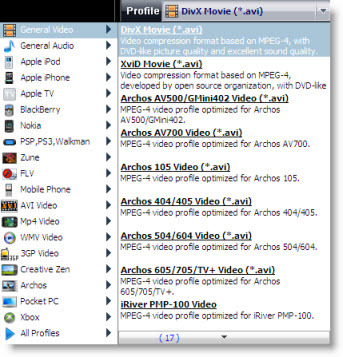 For example, if you want to convert MKV to AVI, you can navigate to "AVI Video" category and choose the format you need from the drop-down list. Note: You can also customize a specific profile to meet your needs. Click here to learn more. Step 4. Click the "Start Encode" button to start to convert MKV to AVI, MKV to MP4 and MKV to WMV. Note: To know about the details, tips and tricks about how to convert video files using Clone2Go Video Converter, you can refer to: How to convert MKV AVI WMV ASF 3GP RM RMVB FLV to iPod/iPhone/Zune/PSP?